^ Masui, Kiyoshi; Juro Hashimoto (1933). Sexing Baby Chicks. https://www.cabdirect.org/cabdirect/abstract/19340101641. ^ Gibbs, Charles S (1934). “Sexing baby chicks”. Poultry Science 13 (4): 208-211. ^ Galli, Roberta, et al. "In ovo sexing of chicken eggs by fluorescence spectroscopy." Analytical and Bioanalytical Chemistry (2016): 1-10. 増井清, 橋本重郎, 大野勇. "雄鷄に於ける退化交尾器官並に初生雛の雌雄の鑑別に就て." 中央獸醫會雑誌 38.4 (1925): 277-287. Shrader, H. L. Sexing baby chicks. 1935. Komatsu, Umata. "Practical methods of sexing baby chicks." (1935). 増井清. "初生雛雌雄鑑別の研究." 富山房, 東京 (1937). Hammond, John C., and Stanley J. Marsden. "Sexing turkeys from hatching to maturity." Poultry Science 16.4 (1937): 287-288. Lunn, John H. "Chick sexing." American Scientist 36.2 (1948): 280-287. 増井清. "初生雛雌雄鑑別." 鶏の性と雌雄鑑別の研究. 日本中央競馬会弘済会 (1975): 42-62. Tao, Yang, and Joel Walker. 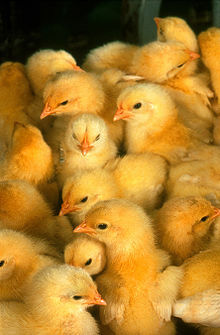 "Automatic feather sexing of poultry chicks using ultraviolet imaging." アメリカ合衆国特許第6,396,938号 28 May 2002.